I’ve used Fiesta’s for my driving lessons in Birmingham for over 10 years. I think they are easily the best car you can learn to drive in. 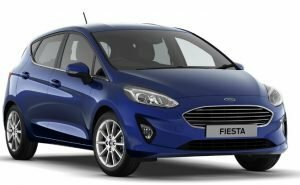 With the all-new Fiesta for 2018, the best just got better! My car has many gadgets but many of them are turned off for driving lessons and tests. I believe that pupils should learn to drive properly and not rely on things they won’t have in their car. What’s the most important feature of any driving school car? The person teaching you. Always choose a good teacher and not just a good car. Here are just some of the Feista’s features that are great for learning to drive. It has many more advanced features you can try out about when you get further into lessons. These are features that really help new drivers by making things easier. Quick stall restart with anti-stall – If you stall then all you need to do is press the clutch down and the car will start again automatically. No fiddling with keys or even pressing a button. The anti-stall system means it’s much more difficult to stall it anyway. Speed sign recognition – The car can read traffic signs such as speed limits and can display the last two you have passed on the display in front of you. Learners often miss signs so this can help out until you become more independent.. Speed limit warning – If you speed then the car will play a chiming sound until you return to the speed limit. This could help save your licence, someone’s life and your driving test! Gear change indicator– Knowing when to change gear takes a lot of practise but the Fiesta makes it easy. Most cars display an arrow showing when you could change up but mine goes way beyond that. It tells you when you could change up, down and even the number of the gear to select. Luxurious quiet interior – This is the most comfortable car I’ve ever sat in. It feels like you’re sitting on a sofa at home rather than sitting in a car. There’s very little noise even when travelling at high speed. I’ve had cars before that were great to drive but uncomfortable to sit in. Automatic lights, wipers and mirror dimming – The car senses rain and darkness and operates the lights and wipers for you. The rear view mirror will automatically dim if there are bright lights behind you and then lightens again when you select reverse. The car will automatically dip your headlights if you are using full beam and another car comes towards you with their lights on so as not to blind them. It can also put the full beam on for you when you’re on a dark road. Eco mode – Turns down the amount of power used by the engine for a more economical drive. You’ll have less acceleration but will save more money and cause less pollution. I call this the “old car button” because when you press it the car loses a lot of performance and it reminds me of driving little 1.1 litre engine cars when I was a new driver. Turbo charger – Driving a car without a turbo is horrible once you’re used to one. If you push the gas pedal to the floor then the turbo activates once the revs get over 2000 rpm. The car launches forward and it can knock your head back as the turbo takes hold! If ever you’ve been on a roller coaster you’ll know that feeling. It’s good to learn how to use things like this safely while you’re with an expert driver. Turbo is what the letter T stands for in TDCI. Auto start/stop – The engine will turn off when you go into neutral to save fuel and pollution. It turns back on when you press the clutch to change gear. You can turn this off if you like. Rear disc brakes – Most small cars have disc brakes at the front (which are strong brakes) and drum brakes at the rear (these are weaker, cheaper brakes). My Fiesta has disc brakes all-round for more powerful braking. Traction control – This helps to prevent wheel spin by cutting the power to the wheels if you apply too much acceleration. It can also apply each of the cars brakes individually if you take a corner too quickly, helping to keep you on the road. 4K Ultra HD CCTV – There are multiple cameras in my car for our protection. You can see them in action by clicking here to learn more about my cars CCTV system. Sat nav – You now follow a sat nav on most driving tests (1 in 5 tests won’t and you’ll follow road signs instead). My car has the same sat nav as the examiners use so you can get used to what it will be like to use it on the day of your driving test. I also have an 8 inch sat-nav that is built in to the car so you can try using a different sat nav on driving lessons if you like. Climate control – The heater is automatic and can keep the same temperature inside the car by operating the heater/air con as it needs to. Now you can keep your hands on the wheel. You can even set a maximum fan speed so it doesn’t get too loud, a common problem with automatic heaters as they often come on at full speed and make lots of distracting noise. Quickclear heated front windscreen – The front windscreen is heated as well as the rear one. Blacked out windows – The rear windows are blacked out for privacy which is great for driving lessons. Puddle lights – Lights under the mirrors show up any puddles by the side of the car when you open the door so you don’t step in them. Tyre pressure monitor – The car warns you if you are losing air from a tyre. Punctures are not always obvious and can cause accidents if you just keep driving without noticing them. You can also see the pressure of each tyre on the screen. Voice control – Talk to the car and it’ll talk back to you. This is used to read out texts, make calls and other things. You might think some of these are more for beginners but activating them and using them can be distracting. Using the wrong feature at the wrong time can easily cause a crash. Speed limiter – Concerned about speeding? When you get to your chosen speed the car won’t let you accelerate any faster! You won’t be able to speed using the gas pedal but it can be overridden by pushing the pedal right to the floor. This can cause sudden acceleration and has to be used with care. Lane assist – If you start to drift out of your lane when travelling at speeds of over 40mph the car can help steer you back into the centre of your lane. A screen in front of you can show your position on the road. This can be helpful on motorways or higher speed dual carriageways. Cruise control – The car can hold the same speed automatically without you pressing the accelerator. You can also accelerate and slow down using finger controls on the steering wheel to stop your feet getting tired. This is great for long journeys and you can use it on your driving lessons and driving test. Hill assist – This can hold the brakes on for a while after you let go of the brake pedal giving you more time to set your feet. It doesn’t always work depending on the gradient of the hill and can cause more problems than it solves. You can see my video here which explains why it can be bad to use this on driving lessons. Alertness score – The car gives you a score from 1 to 6 to show how alert you are. It monitors your use of the accelerator, brakes, how smoothly/erratically you are steering, if you’re holding the wheel or not, your position on the road, your speed compared to the speed limit and other things. Driver alertness aids – If the car thinks you are falling asleep or may be ill then it can beep and flash lights to warn you to pull over and take a rest. If the steering wheel doesn’t move at all for several seconds then it assumes you may have taken your hands off it or have fallen asleep. Emergency assist – Should you have a crash which is bad enough to deploy the airbags then the car can automatically call for an ambulance. It can give them a distress message, your location and activate the hands-free speaker. Every second counts after an accident and this could save your life. We can’t try this on driving lessons but I think it’s a great feature.